This is it. 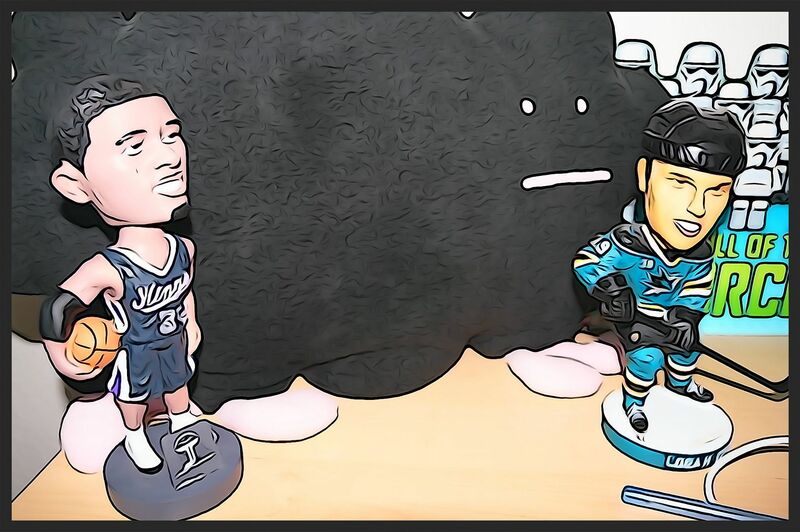 The swan song for Panini hockey. 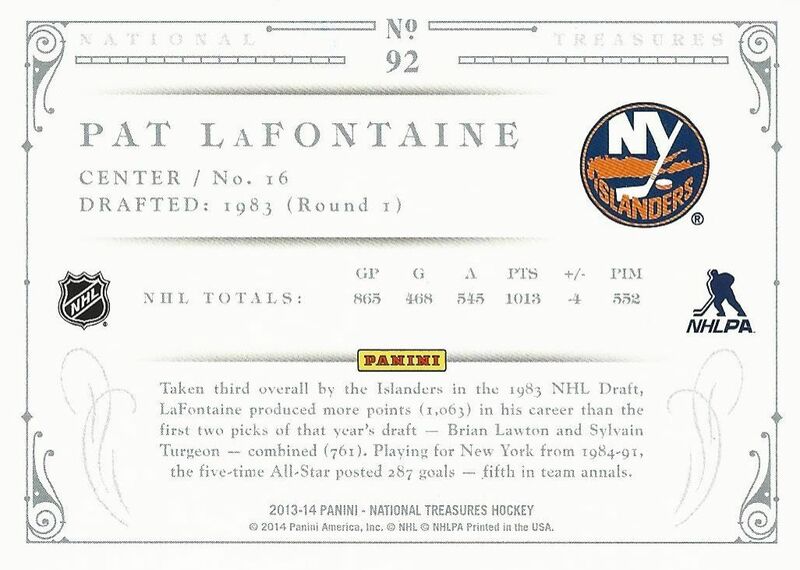 It seemed like it wasn't too long ago that Panini even acquired the NHL license, and now, their final product has released. Panini's highest-end brand is National Treasures. It's been released for baseball, basketball, and football. 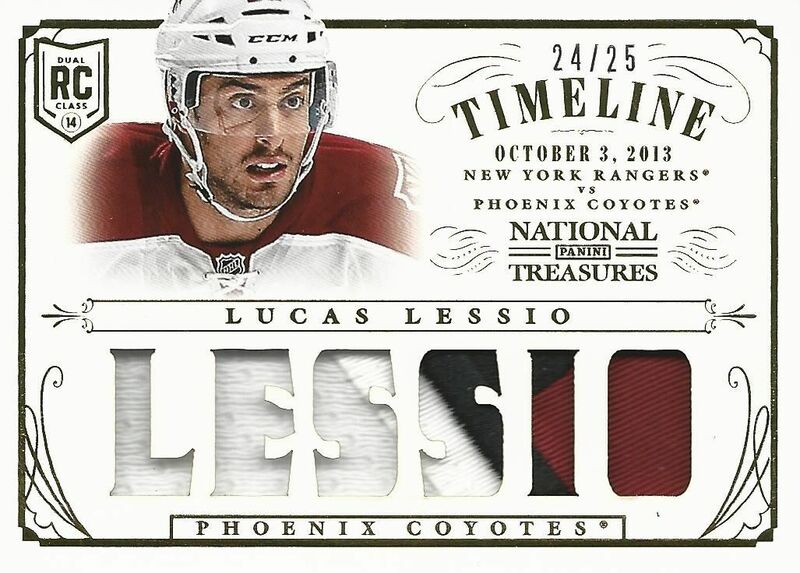 It's only fitting that Panini caps off their hockey run with a hockey release of this collector favorite. National Treasures has always gone with an elegant white motif, and it works particularly well with hockey. The base cards are very thick and feel like a top tier card should. I love how the player image is very large and almost popping out of the card. The full color picture looks great on the white backing amidst the thin foil design elements surrounding it. The fonts are restrained - there isn't anything over-the-top... and there isn't anything that calls attention to itself. It's just a well executed card that fits the the mold of a great premium card. The numbering may be a bit hard to see as it can be hidden in the player picture, but each card is serial numbered to just 199. The back of the base cards continue on with the quiet refinement of the front. No, there is no player photo - but that simply isn't needed on a card such as this. All the information on the back is laid out in a concise manner. The minimal design elements around the card are just enough to give a lot of class to the card. The backs are well done, and perfect for the National Treasure brand. 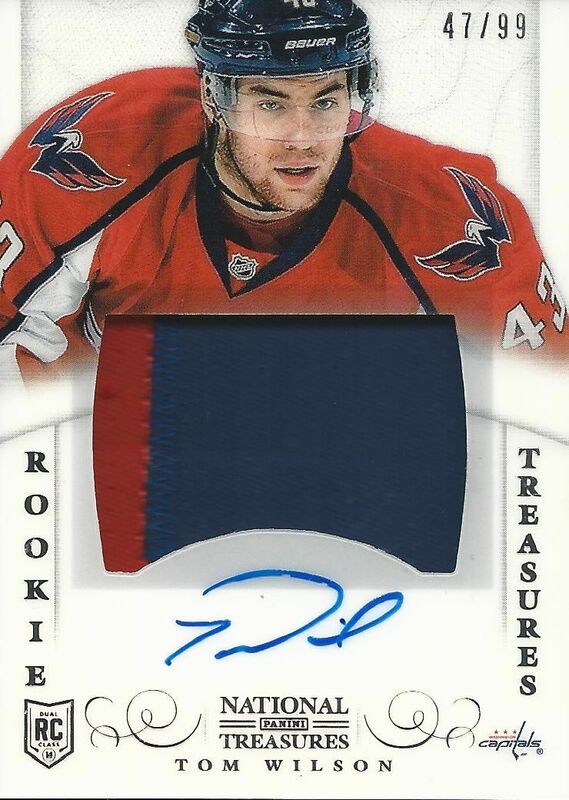 As with all top-end products, the rookie cards in National Treasures feature both an autograph and a large piece of patch. These Rookie Treasures cards have a unique acetate top that gives the card a slightly translucent look to it. The overall design of the card is very nice with the patch getting center stage. While I do think these cards a well done, something about them just doesn't sit perfectly with me. Is it the oddly shaped patch window? Is it that the patch is too centered? I'm not sure. But while these rookie cards are good, I hesitate to say they are great. That being said, I'm sure these cards will be coveted by collectors as the top Panini rookie card to acquire. The hits in National Treasures outnumber the amount of base cards. 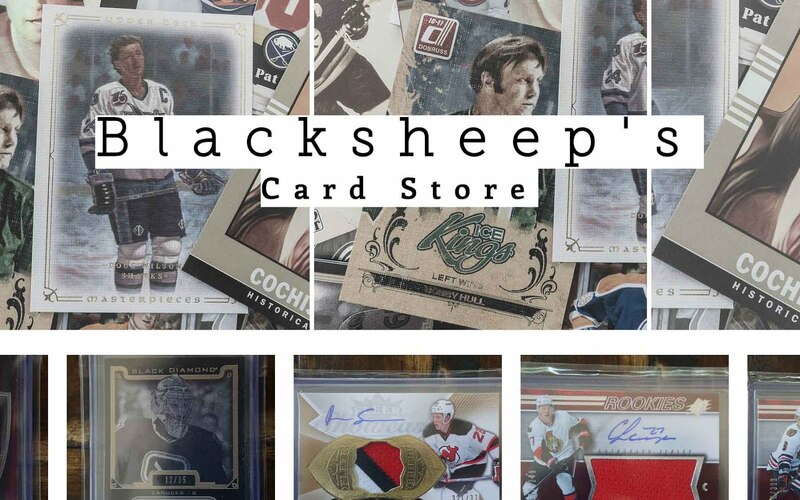 When collectors open up a box of National Treasures, they are in for a big helping of jerseys, patches, and autographs. Panini has even pretty much guaranteed 1/1's in these boxes as each one has printing plates put in for good measure. One of the first things you'll notice in the boxes of National Treasures are the two thin printing plate cards added in. Most boxes I've seen two, but some have one and some have had more. Printing plates have lost a bit of luster in recent years as collectors have tired a bit of them. Yes, they are 1/1's, but most don't call them a 'true' one-of-one card. They remain unique collectibles though, and nice additions to player PCs. Timeline cards are fairly common game and event-used cards found in National Treasures. The Timeline cards feature a specific date of note from the player pictured. 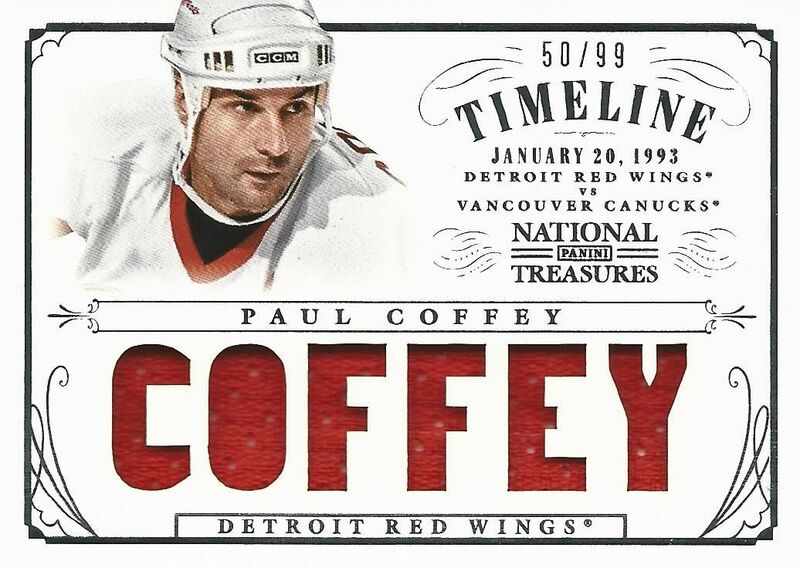 This Paul Coffey jersey card recalls the time he was traded from LA to Detroit. The back of the card states that the jersey pieces are game-worn, but there is no mention that these pieces were from the game on the date listed on the front of the card. Here's a card similar to the Coffey Timeline card. It's of Coyotes rookie Lucas Lessio. The card features a very nice looking patch pieces within the name cut-outs, but on the back it clearly states that the patch is even-worn. So the pieces jersey embedded from the card definitely didn't come from the game date listed on the front. Instead, these pieces probably came from a photoshoot or rookie training event. Speaking of event-used, it's likely that most of the rookie content in National Treasures was from a rookie event rather than a game. It makes sense as this has been the tradition of card manufacturers to get a lot of material from the rookies before the season starts. 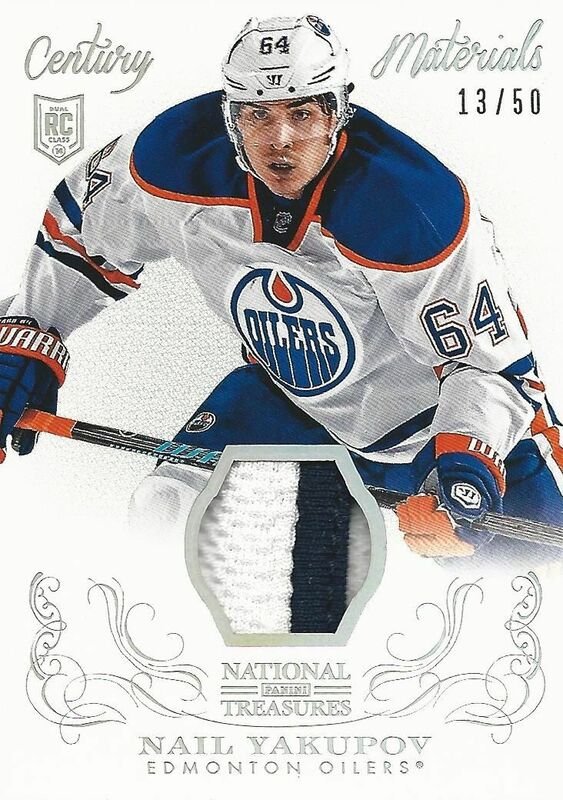 This patch piece from Nail Yakupov is a good example of that. The card itself is well done though - it reminds me of a base card with a patch window, though this design is clearly different than the base design. Autograph lovers will find plenty to like in National Treasures. 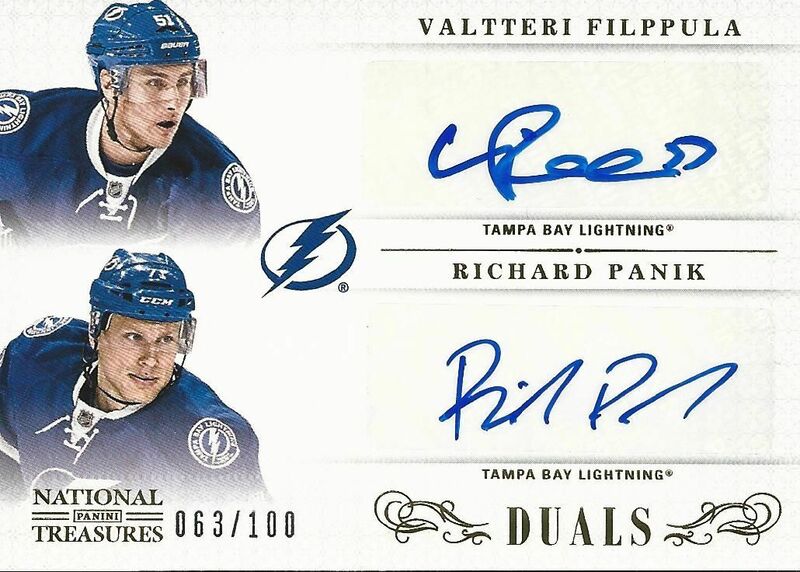 This very cleanly designed dual autograph of Valtteri Filppula and Richard Panik is nice, but there are many cards that feature even more autographs - I've seen up to four on each side! I do have to mention that these autographs are not of the on-card variety. As Panini has to move out all their hockey content, I'm sure they tried to use up everything they had - including these sticker autographs they have. National Treasures doesn't just contain rookies and current stars, but also has older player autographs within. Fans of older school players will enjoy cards like this Pierre Turgeon game-used jersey and autograph card. 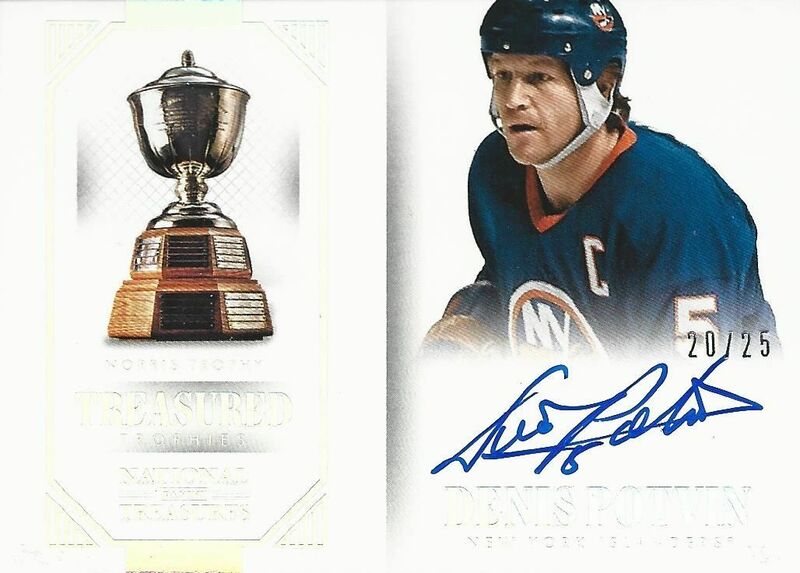 Unlike some of the content from National Treasures, this card has been signed on-card, and it really looks great. The large piece of jersey is nice too. Speaking of players from yesteryear, I got another one from my box - Denis Potvin. Though this card doesn't feature memorabilia, it is probably my favorite card of the bunch I got here. This card is well-designed and clean. You can't see it from this scan, but this card is actually made of two layers. A thicker bottom layer and a thin top layer that you can clearly see by the black outlining on the side. This card is also signed on-card. 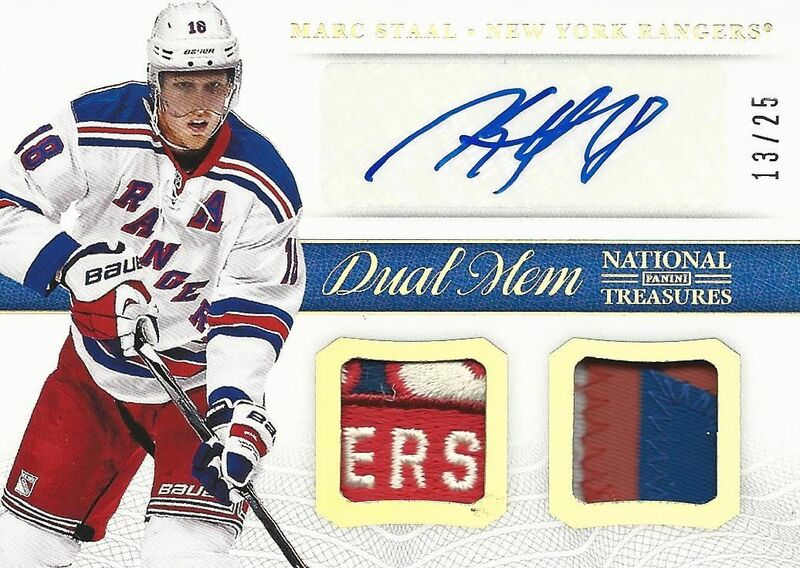 This Marc Staal autograph and patch card is probably the 'best' card from the box I opened. It's a great looking card with some very sweet patch pieces embedded within it. 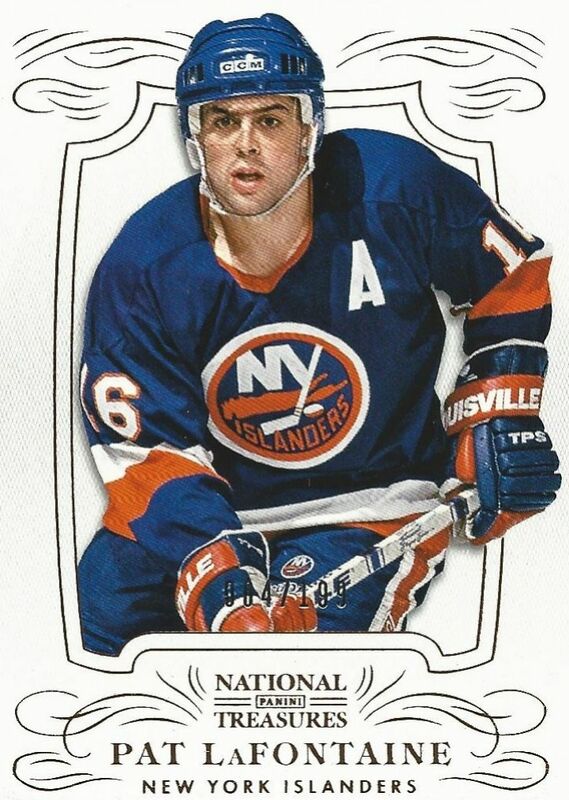 Though the card is very nice, I'm not sure how many people would covet this card besides New York Ranger fans. It might make for some good trade bait. My box of National Treasures was a bit of a let-down as there was no clear 'big-card' in it. I think I got a pack that was filled with 'medium' cards. This box was definitely below average from what I've seen. If you see breaks of National Treasures, you'll see many book cards come out, some with a ridiculous amount of jersey or patch pieces on them. There is much to be had out of National Treasures this year. Panini has really put everything they could into it. My box opened today definitely did not tell the story of National Treasures this year. But take a look at the many breaks online and you'll see some pretty sweet things coming out of NT. If you want to get into National Treasures, be prepared to spend hundreds of dollars for a box of it. This stuff is expensive! But that's the price to pay for the top of the line hockey cards from Panini this year. My box of National Treasures didn't really satisfy, but I realize that not all boxes can. There are plenty of collectors who will open there boxes and pull out amazing rookie cards worth the amount of their box or more. Purchasing National Treasures is definitely a risk... but it's a very fun risk. Getting the chance to open up a product like this is extremely thrilling. And if you pull something amazing... it's even more thrilling. Would I recommend getting a box of this if you could? This and The Cup are the ultimate hockey products that you can find. As a hockey card collector, being able to open up these products is the pinnacle of collecting - especially in terms of busting wax. So if you can, go for it. Take the plunge! There are not many who can. Wow - I love it that panini threw all thememorabilia they had in their closet at this product! It is a shame they lost the licence. I hope they get back in the NHL soon. Your box was pretty good! 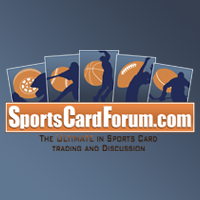 Did you know that all sticker autos in this product are considered "bonuses" and don't count towards the guaranteed 8 cards? Hopefully panini hockey gets it's license back, great break as always, can't wait for contest!!! Your box was really nice with a lot of low numbered cards. Hopefully Panini will get their license back for the amazing things their company can make. nice product. glad paniini finally did an actual NT this. That was actually a pretty good box! That dual patch auto book redemption will be so sweet! Nice Cards!!! That's a sick product. Not the best box but hey you still get some great cards, this might be better than the cup. Panini has gone all out, too bad we won't be seing them in the future. Nice product and all, but it's lacking some umph. I can't get around to spending that much money on a hit and miss product. Where are all the big names? I haven't seen any big hits so far. It's a 7/10 if you ask me. Not the greatest box for sure, some are amazing though, hope to manage to scrape up the $$$ to grab a box before it disappears and/or skyrockets in price. Not a fan of the sticker autos in a product of this price though. Great Base card design. 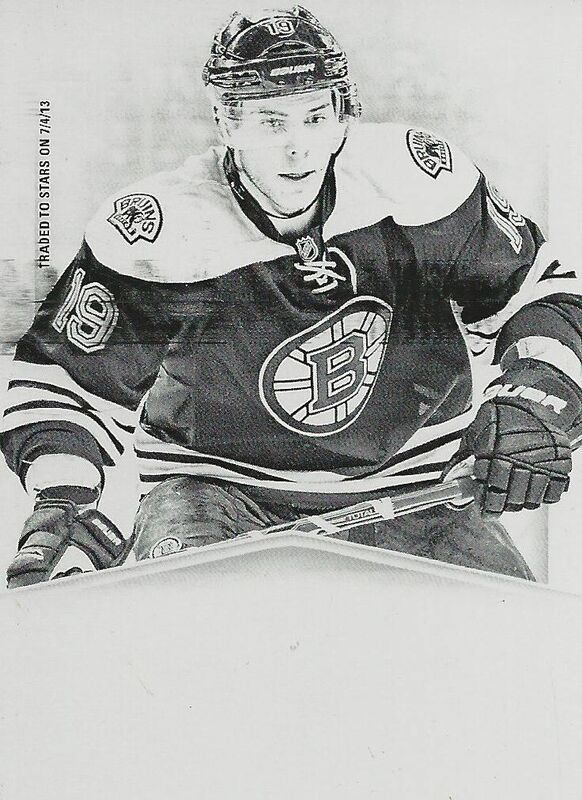 I love the RPA /99 rookies and last let Denis Potvin card has a cool design to it. Amazing product, You got an okey box i guess. That Marc Staal as you said is a really beautiful hit! Awesome product, wish I can get myself a box of this stuff. Really like the autos and patches. It's really a hit or miss, but a nice bang to the end of Panini hockey. Great breakdown. Agree with your assessment of the box. Not a huge card that stands out, but for suer some smaller cards that are pretty. Staal is a great example. Stickers in this product also because as you've pointed out, Panini is just moving inventory. Overall, the design of the product is still great. NT is just ridiculous product with their diamonds and 24 piece booklets. It says a lot that your box was below average, maybe even weak compared to NT´s average box. Over the top product in every way. Panini clearly wanted to go out with a bang. I liked the review but I was hoping you would have got an awesome box for your review! Being in the hobby for almost three years, this product by far stands out the most. Although the price range is quite high what you get inside is another thing. Best product yet and by far that Panini has made in their journey in the hobby. Absolutely loaded product. I love all the extras and there are some crazy case hits to get. A sweet looking fresh product for hockey. I really liked that box! Nice Turgeon! Nice Pierre Turgeon! I really like these cards... the design is just great! Great box, I like how you put so much information in your reviews. Great video as always! + The product is loaded with sick patches, shields..you name it. + Panini is ending their relationship with the NHL in a fantastic way. - A lot of sticker autographs and event worn memorabilia. Not the best box but this product is just amazing!